Are Antler "Spatulas" pressure flakers? 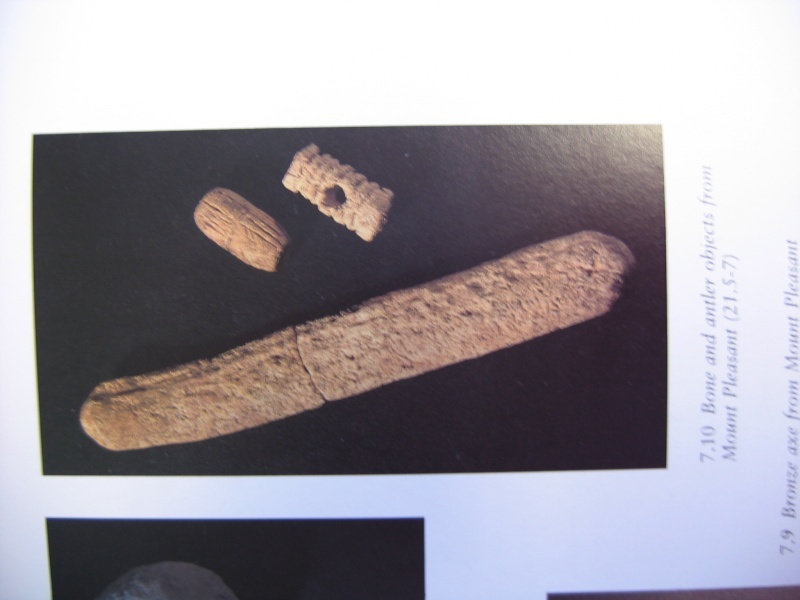 This one (bad photo) is from Mount pleasent, Dorchester, Dorset is discribed as "Bevelled at both ends, one worn as if by use, poss leather working tool" Length 118mm. Re: Are Antler "Spatulas" pressure flakers? And here are a few examples from Amesbury Grave g.85. F3, F4 and F6 look again like unhafted Antler pressure flakers. Could F5 be a punch? F6 does look a bit like a pressure flaker to me. At least if I picked it up, that's what I'd use it for. There again, it also looks like one of my bone folders. 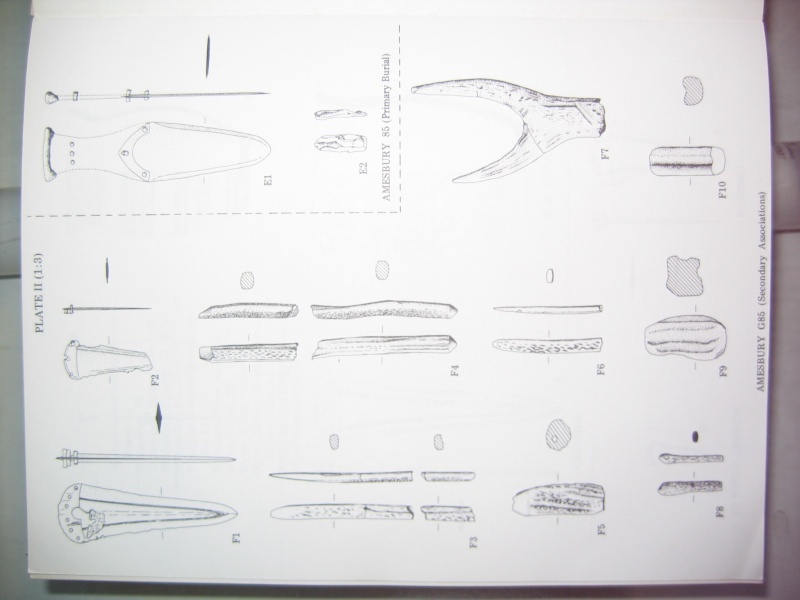 F5 could well be a punch or a punch handle, also F9 and F10 look rather like abrading stones. 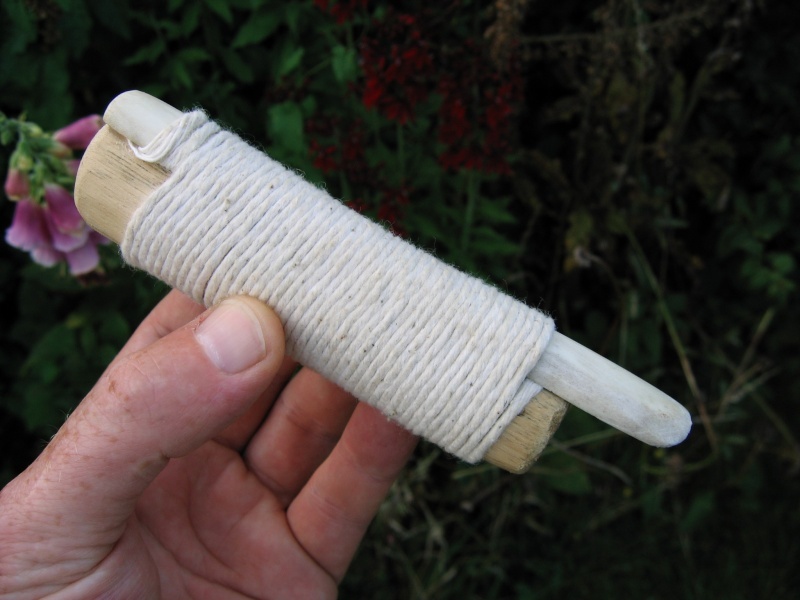 This is a similar pressure flaking tool that I use for flint knapping demos, note the antler "spatula"! The tools make more sense when you see the antler hafted. also i have found a bronze age dagger line the one in the pic lower lh end. Still want to try the nettle string on my next blade. 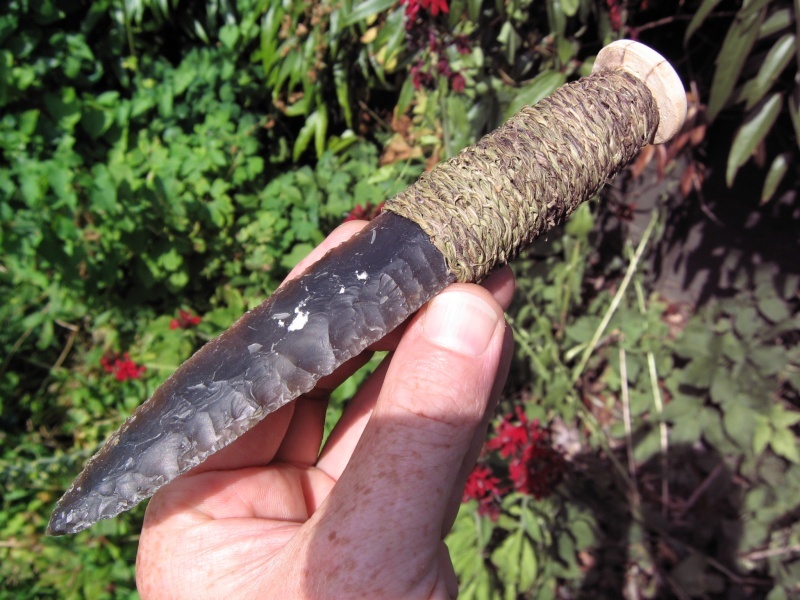 Talking of nettle string, here is some put to good use on a Charavines knife, this one needs a little more work but it works well for cutting back the plants that have burst in to the shed, it was what I had to hand! By the way I'd get the nettles soon as they will be dying back in a couple of months. Beautiful is it flat on the other side? Did you detatch a livre de beurre flake? Also a touch of synchonicity as I made plano-convex knife (slug knife) myself today. Just gottat retouch it and I'll get the pic up. It is flat and plain on the reverse, as for the pound of butter core, it was something similar, had some sausage shaped black flint but it was full of chalk pockets so I harvested some long flakes from it and just ended up using it on this project! Here they are a couple of knives common to Britain. At the top a plano-convex knife (slug knife). These knive similar to French Charavines knives and Egyptian Gerzian Knives were only knapped on one side, the other being flat. Below is a regular bifacial knife. Nice work, it's a bit odd not having to worry about the imaginary centre line! 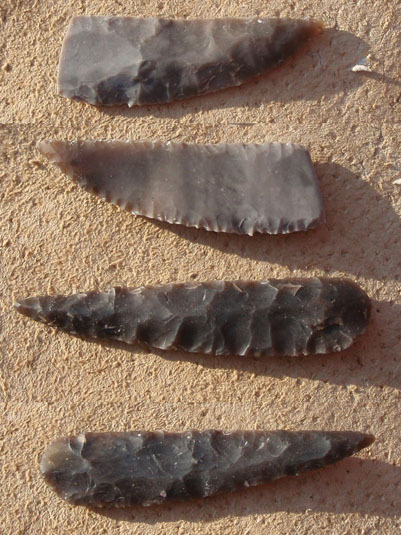 Have you tried knapping a sickle blade? » Crankcase Pressure Fitting use with Tee Dee Engines.